He Cuts Pallets At An Angle And Nails Them Together For A Holiday Item You Must Have! Christmas is just around the corner and I am still yet to share some of my favorite crafts of the season with you! This easy upcycled pallet Christmas tree made from pallet wood and has to be one of my all time favorites! It has my favorite components of the perfect craft, a little bit rustic and a little bit new. 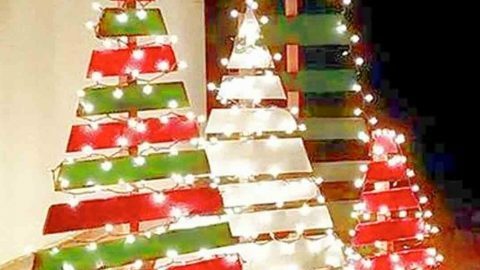 A pallet Christmas tree is perfect for inside or outside as well! I’ve seen some really adorable DIY Christmas trees on Pinterest lately. If you just want to add an extra tree on your patio that is unique and different, this one is super cool and easy and it looks fabulous painted green with Christmas lights on it, and, of course, a big red bow at the top! I absolutely love every opportunity to use pallet wood for my projects. The rustic quality of pallet wood adds so much rustic charm to a home! Pallets are leftover woods or simply that are considered to have no meaningful use. However, you can easily turn them into beautiful decorations and, as you can see, there are tons of amazing DIY projects you can make with them! This is quite different from a traditional tree and I’m sure that your friends will be looking for pallet wood after seeing your pallet wood Christmas tree! Watch how DIY Baron makes this awesome pallet wood tree in his step by step tutorial so you can get busy making yours!